On my first day of summer vacation (July 5), I found time to mulch the garden (much needed) and go pick blueberries before the heat index hit 105 F.
Remember, this was my first day of MY summer vacation. No phones ringing, no students wandering in, no worrying about the master schedule, no worrying about replacing teachers….basically no school worries. As I pulled into the local U-Pick farm, I was horrified to see a bus. Yes, elementary day-campers had taken over the farm. I almost pulled out and went home. 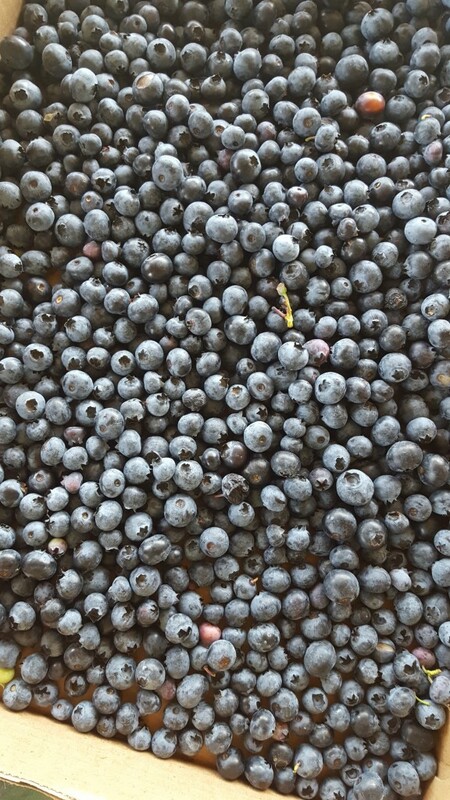 I’m glad I persevered because blueberry picking season was almost over. I sweated for about 45 minutes and picked a little over a half-bucket. The berries were small but still super sweet. I have recently been asked to provide some jars of jam for a friend’s wedding reception so I decided to experiment with a new jam concoction. 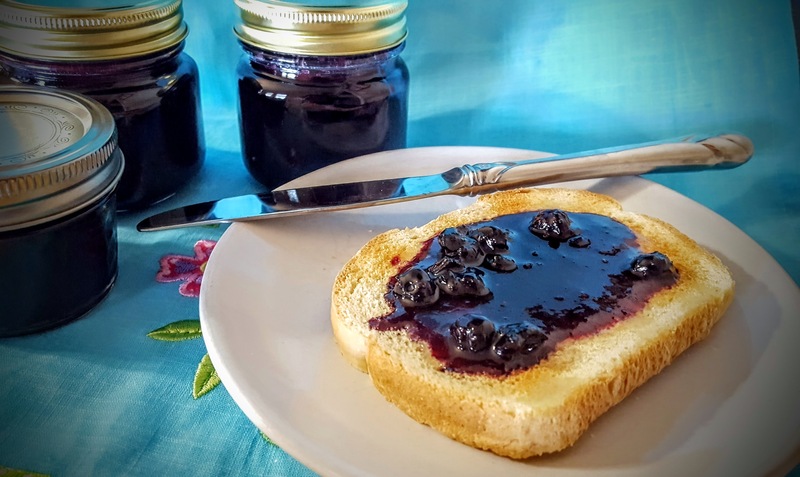 Because powdered pectin was used, this was a super easy jam to make. First, start sterilizing jars and lids and start the water to boil in a canner. Wash berries and drain well. In a large saucepan and using a potato masher, lightly crush berries. Add lemon juice, cinnamon, and water. Stir in pectin and bring to a full roiling boil over high heat. Stir frequently. Add the sugar and return to a full rolling boil. Boil hard for one minute, stirring constantly. Remove from heat, quickly skim off foam (if any). Ladle jam into hot sterilized jars, leaving 1/2-inch headspace. Wipe rims and adjust lids. Process 5 minutes in a boiling water bath. Remove from water bath and let stand until jars are sealed. I cannot put into words the deliciousness of this jam. I didn’t prepare quite enough jars so I thankfully had some jam I could dive into immediately. 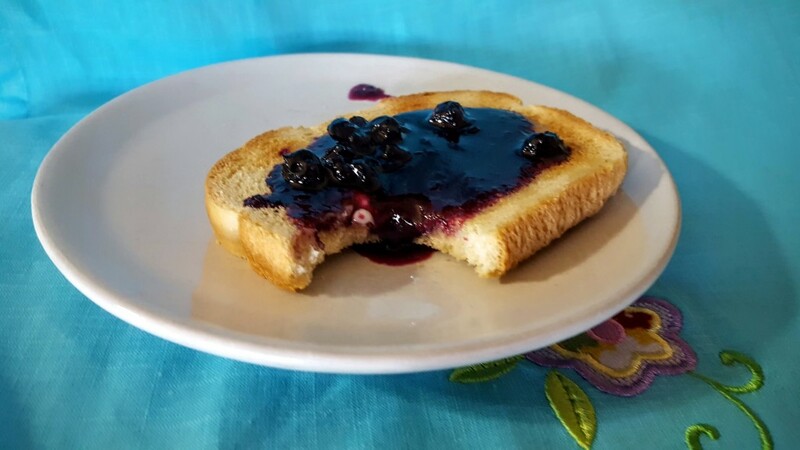 This Blueberry Spice Jam exceeded all my expectations. I can’t wait to see if it is wedding reception worthy. Seriously, this might be the most delicious jam I’ve ever made! The original recipe said to use whatever spice you wanted or combinations like nutmeg and cinnamon. I am so glad I went with the cinnamon pairing. I love the add of cinnamon..I wish I could taste some of yours…it looks really great on the toast. Thanks, Angie! It was really good on that toast!